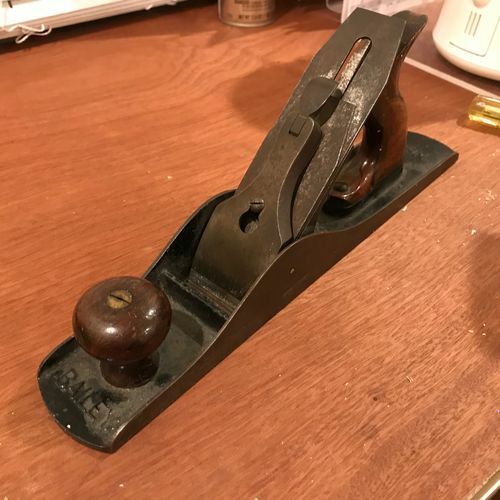 I posted a while back about all of these hand planes I got from my grandfather and I’ve finally begun to restore them. I’m working on the no 5 stanley now and I’ve cleaned off all of the dirt and grime and I’ve got the sole pretty flat. I’ve been using granite tiles with sandpaper (120, 220, 320) and man it works really well not just for flattening but for removing all of the rust. I’ve noticed that these places start to rust up after a day or two so I would like to get them cleaned up. Also, I want to get the plane super nice looking to show to my grandfather. After that I am just going to use the hell out of it. I’m happy with the flatness of the plane so but I want to remove these little spots. Thanks and more questions will be coming soon from me I’m sure. You might try a wire brush on the spots then treat with WD-40. If they are etched in, might need to sand more in order to get rid of them. One other option would be to put the whole body of the plane in a soak of Evapo-rust or something similar. That would leave the etched areas although they shouldn’t rust afterwards, especially if you treat with WD 40. 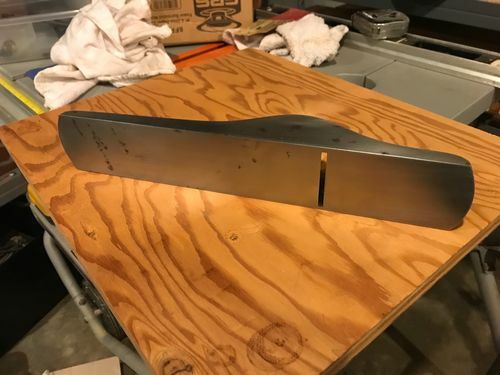 If you solve the rusting problem you mentioned, the spots shouldn’t affect the performance of the plane. You might try a wire brush on the spots then treat with WD-40. If they are etched in, might need to sand more in order to get rid of them. One other option would be to put the whole body of the plane in a soak of Evapo-rust or something similar. That would leave the etched areas although they shouldn t rust afterwards, especially if you treat with WD 40. 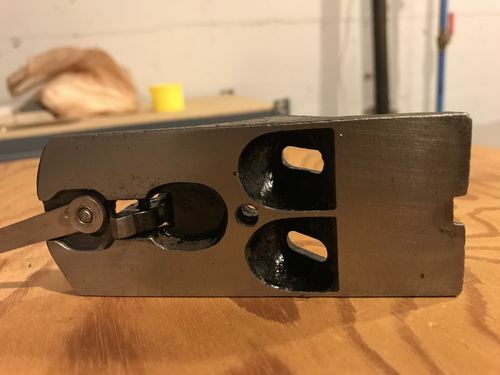 If you solve the rusting problem you mentioned, the spots shouldn t affect the performance of the plane. Do you recommend a brass wire brush or something heavier? The spots are character, and don’t mean a thing. Soak a rag w/ wd40 and wipe the plane down to prevent rust. Looking good! So I the little spots have to be put aside for now because I noticed something just a minute ago that has me a bit worried and bummed. It looks like the sole has tiny, tiny cracks at the corners of the mouth. They are hard to see and harder to take a photo of but I ran a photo through photoshop and You should be able to see what I am talking about. 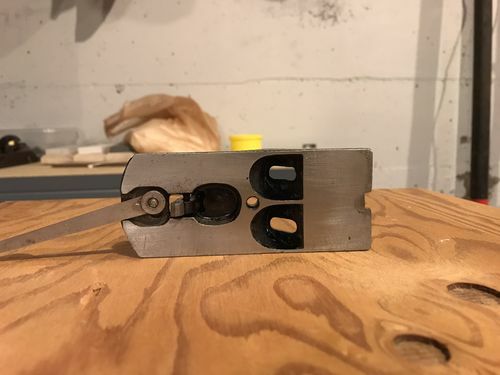 If the plane is going to be a jack plane, I’d suggest Just using it. The cracks will get worse and there is no easy way to fix them. That is not what I wanted to hear. What a shame. This was my great grandfathers. It’s over a hundred years old. Well, at least I can still use it. I’ll get it into shape and looking nice to show my grandfather and keep an eye out for another jack plane. 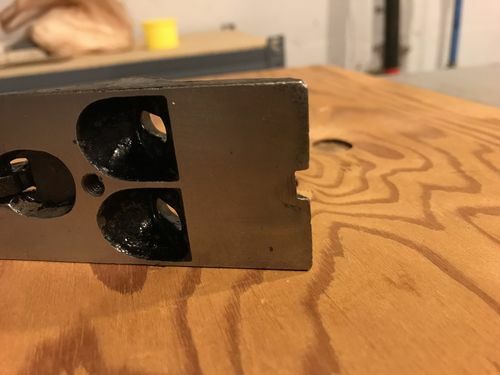 There is a fellow, named Dave Bardin….who silver brazes cracked plane bodies…..the Millers Falls #14 I have been using of late…was repaired by Dave. As for that tiny crack? Not worth worrying about….keep an eye on it, but, don’t worry too much about it. That’s a little more reassuring. I still can’t get rid of those darker marks and you can see one of the sides has some as well. The other side is as clean as a baby’s you know. After working on it for a while I am pretty sure that the black marks are just large pitted areas and I just can’t get in there to clean them out. Someone mentioned evaporust but I don’t have any. Only thing I have is citric acid which I am going to need on a few parts on some of my other planes. I was thinking about making a super diluted solution of it and just work it into some of the marks with a brush but unless someone chimes in and says “yeah that will totally work” I am just going to let the sole be as it is. Though looking at that photo again those damn marks are really bothering me. Anyways, on to the frog and the iron and cap iron, etc. 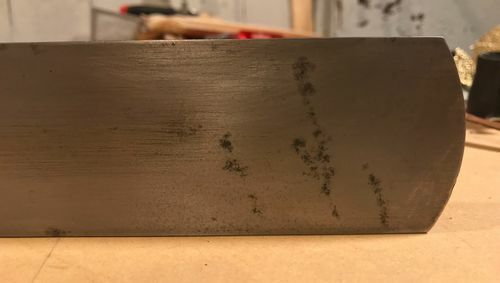 I am just going to clean the rust off of them and I’m probably going to hold off on honing the iron until I practice honing some chisels. I’ve got 3 arkansas stones and one of those honing guides from Robert Larson and I haven’t used them yet. I know it’s not a big deal and won’t effect how it works but I would like to clean it up. Should I just hand sand it? If it ends up that I need to refinish the handle what do you all recommend? BLO? Shellac? Thanks guys for all the help and hand holding. And definitely chime in to scold me for doing something wrong. I would leave the tote as it is. Your grandfather may have a story to tell about the chip. A brass wire brush or wheel works well to get the rust out of pits. If you’re having rust re-appear quickly, apply a coat of oil or wax when you quit working on it for the day. Unprotected metal loves to rust. I use the Paul Sellers oil can to coat my tools. Stuff a rag into a small can, soak it with a light oil (I use 3 in1), then just wipe down your tools after using. I would clean up the iron and cap iron, and put this plane to work. It looks good. Thanks for all the replies everyone. Really appreciate it. No story behind the tote most likely. My grandfather probably didn’t use the planes all that much. They probably haven’t been used and have just been sitting in the basement for the last 40 years. I already sanded the knick out of the tote. The knob has a some kind of burn mark on it that I am going to work out. I’ll give them a good sanding and was thinking of just putting some shellac on them. I think I have that spray on shellac. Then a bit of wax. I worked on it for a while and still couldn’t get the front of the frog cleaned up. I feel like the whole thing needs to be flat, especially that front edge but what do I know. How far should I take this? Lap it until the whole things is flat? 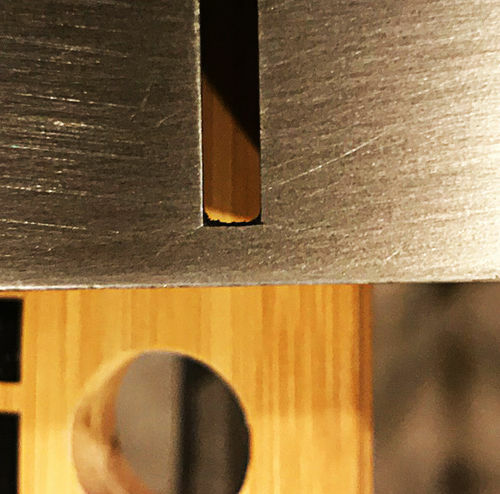 Roland Johnson had a nice article in Fine Woodworking a few years ago. I can find the date if you want to find it in your library. He has a video class for about $40 but I think that’s a bit pricey. I restored a couple of No. 5 Baileys using his directions and they turned out fine. I don’t think he suggested flattening the top of the frog but he did use lapping compound to seat the frog on the body. Mine performed pretty well with the original blade but I put a new Hock blade on it based on some advice and the improvement was noticeable. I wouldn’t try to do spots. More than like you get a bunch of flash rusting and it would have to be pretty strong to work that way. You can make it pretty strong without hurting anything. I usually stopped when i couldn’t take it getting into the cuts in my hands. Have a tub of water and baking soda nearby to neutralize and dry it as fast as you can or it might flash rust. It’s Easily cleaned off but just be aware. Those spots are indeed some pitting. I agree with just counting them as character, but it you really want to get them out, the only way would be to remove enough metal from the plane to get to the bottom of the pits. Short of that, evaporust is a good way to go. It won’t remove the pits obviously, but it can lessen the appearance of them especially if you wire brush them after. Come to think of it it’s worth trying the wire brush first before chemical methods, as it may do enough. Try a fine brass wheel first, then you can work up to coarser steel or braided steel, etc if you want. I usually use citric acid instead of evaporust because it is so much cheaper than evaporust, but it does etch all of the metal a little bit. Evaporust is acid based too but it has other things in it that seem to make it gentler on the metal that isn’t rusted. The cost is not worth it to me except for tools that are special in some way. It’s $25 a gallon or so so not terribly expensive and a gallon can clean a lot of tools since you use it over and over.